The Water Level Sensor has been upgraded quite a bit. 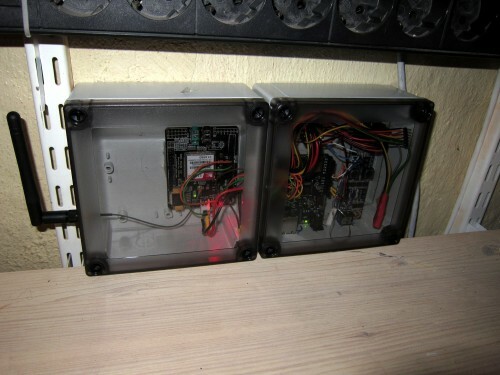 I added another sensor, for the second sump pit, but the biggest addition is the GPRS-module (to the left.) So now, if the water level rises above a set trigger level, the house will send me a text message. I don’t expect that to happen any time soon but if it happens you can be sure that I won’t be there to notice until too late. Well, not any more, at least not as long as all the electronics work and I remember to charge the SIM regularly. I rewrote most of the software in Arduino 1.0 and added automatic logging to a Google Docs spreadsheet. That works nicely for keeping an eye on things when online. Also I’ll be able to make all sorts of (useless) statistics. There are more details coming up with source code and detailed explanations but I’m not really there yet. Just leave a comment if you have questions and I’ll provide as many answers as I can. did you used the MPX5010DP for the second sensor ? I`m seraching for a sensor that can directly be connectd to the ardiuno board. No, I tried something completely different. I used a Ping ultrasonic sensor, encapsulated in a small box and mounted at the top of a 75mm plastic pipe. That seems to give mostly accurate readings at a distance of 2m and possibly more. I don’t know what the moist will do to the sensor in the long term, though, and I do get some weird stray measurements that are totally out of range, but that could be down to memory issues. My most recent sketch really needs to be reduced. If you do opt for the MPX5010DP, don’t forget to check the datasheet for how to connect it. I’m not sure what’ll happen if you connect one of the outputs to ground and the other to an analog input on the arduino. It could break the sensor. You may need to buffer it somehow. Perhaps use a couple of Op-Amps anyway but in a simpler setup. Hello, I am Ciro and I write from Italy. I am interested in your project, you can get more information on the project?